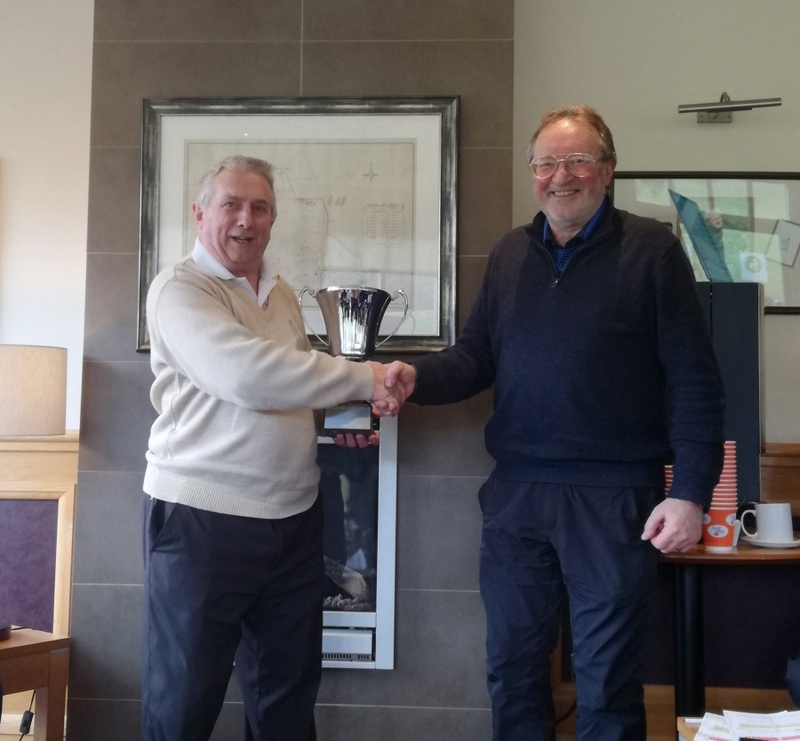 Thursday 7 March saw the final competition in the Seniors Winter Championship. 21 Competitors turned out on a cold blustery day with 9 of those in a with a chance of scooping a top 3 place. Just to increase the pressure on these leading golfers, they were drawn in reverse order at the end of the field. Ron Duncan the leader over the past two weeks couldn't cope with the pressure and had his worst round of the season (by some margin), but in the end he finished with a big smile on his face, since all his nearest competitors failed to make any progress. Congratulations to Ron who finished with 94 Merit Points and walks away with the trophy. In 2nd place was Dougal Spaven only 2 merit points behind on 92. 3rd place went to John Payne 90 merit points, John crept into 3rd place after a good last round. Thanks to all the Seniors who took part in the championship over the winter - now you can all look forward to playing off your normal Handicap once again!! Senior's Captain Trevor Hayes presents the 2018 - 2019 Winter Championship Trophy to the winner Ron Duncan. The Seniors section at Pitlochry Golf Club was first introduced in 2013, and now has over 80 members. Our section is open to all paid up Pitlochry G.C. and Blair Atholl G.C. members aged 55 and over. Our primary objective is to offer our registered members an enjoyable eclectic mix of serious and fun golf in a friendly and sociable environment. Although we all enjoy our golf, the fun and banter is very much an important part of our weekly get-togethers. In the summer season we play on Mondays from 08.30am and entry sheets for each competition are posted on the Seniors’ notice board approximately 2 weeks in advance. A draw is usually produced on the Saturday or Sunday preceding the Monday competition. Details of the format are given on each entry sheet and a full Fixture List is provided and can also be found on the Seniors’ notice board. ALL of our competitions are played off the forward yellow tees. Handicaps are not required before you join as you can play for your handicap in our weekly competitions. Three (3) such card entries are required. We open each season with a Singles Stableford for the TCL Decanter and play at least one qualifying medal round every month. There are 12 qualifying competitions over the season - 6 each on stableford and strokeplay formats. The top 15 players in each qualifying competition gain Merit Points towards the season's Order of Merit Championship. We also have a Seniors match play knock out championship (for the Neil Panton Trophy) and a Pairs competition for the 4 Ball Better Ball Dyson Salver. Our eclectic mix of team competitions includes, Texas Scrambles, Stableford 1-2-3, Scotland v England and other 2/3 man team events. Some of the team events are drawn teams, others can be entered as a team and we will make up teams from the remaining entries. We currently play 4 Inter Club social matches (2 home, 2 away) and have a Seniors outing each year. In the winter season we continue our golf with a Winter Championship Trophy competition. This is a Turn Up and Play competition, played on a Monday and Thursday (09.50 draw) . The weather can throw up some real challenges, but that does not stop a very enthusiastic bunch of hardy golfers from enjoying their golf throughout the winter period.